Catherine Betsy Phelan, A’34, Lenexa, Kan. died April 25, 2015. She is the sister of Isabelle Phelan Boger, A’37, Alexandria, Va. Betsey was preceeded in death by two sisters who also attended the academy: Jane Phelan Miller, A’32, who died in November 2001, and Margaret Peggy Phelan, A’41, who died in March 2005. Sister Jeanne Marie Zeugin, C’37, Leavenworth, Kan., died Nov. 7, 2014 in Ross Hall. Sr. Jeanne Marie is the sister of Gertrude Zeugin Bauder, A’31, C’35, M’67*, Helen Zeugin Bristow, C’42, Antoinette Zeugin Duffin*, A’40, C’44, and Margaret Zeugin Liebeno, C’46. She is also the aunt of Sister Marianna Bauder, C’70, Ellen Bauder Hustings, C’70, Rose Marie Bauder Pettyjohn, Sister Helen Bristow,* C’65, Patricia Bristow Moulden, C’69, John Bristow, C’87, Jeanne Marie Duffin Hund, C’69, Eileen Duffin Willcott, C’73, and Sarah Duffin McGlinn, C’75. Sister Mary Ellenita Uhlrich,* C’52, was her cousin. Sr. Jeanne Marie faithfully served as a Sister of Charity of Leavenworth for 81 years. Florence Koch Fischer, A’39, C’43, Beattie, Kan. died March 13, 2015. Virginia Burke Wasson, A’40, C’44, Kansas City, Mo., died May 18, 2015. She is the sister of Jean Burke Maupin, A’42. Frances Eileen Morrissey Evans Ruttinger, C’41, Osawatomie, Kan., died May 2, 2015. She requested memorial donations be made to the University of Saint Mary. Sister Mary Vincentia Maronick, C’45, Leavenworth, Kan., lost her cousin, Jane Maronick DeWolf, on April 24, 2015. Jane is the sister of Mary Jo Maronick Tanzey, C’62, Coeur D’Alene, Idaho, and Barbara Maronick Sample, C’67, Billings, Mont. Sister Joan Cordis (Marjorie) Westhues, C’46, Maryknoll, N.Y., died June 13, 2015. She spent most of her religious life in the Philippines and retired to Maryknoll from Bangaldesh a few years ago. Sr. Joan Cordis was the sister of Jane Westhues Schmidt, C’47, Phoenix, Ariz., Elaine Westhues, C’61, Mesa, Ariz., and Marilyn Westhues Evans, C’55, Des Peres, Mo. She was preceeded in death by two sisters: Rosemary Westhues Rieke, C’39, Marie Westhues Straub, C’43, and her brother, Monsignor John Westhues. Rosaleen Craig Buthod, C’47, Tulsa, Okla., died April 8, 2015. Rosaleen is the sister of Therese Craig Shelton,* C’45, Elizabeth “Pan” Craig Hottinger,* C’47, Sister Maureen Craig, C’61, and aunt of Kathleen “Patty” Moore, C’74. She was the daughter of Sir John and Mary Craig who donated over 2,000 items to De Paul Library—among them are 45 single-leaf manuscripts from the 12th century; nine books of exegesis, philosophy, and theology; and eight Bibles printed before 1501. The Craig family also gave hundreds of paintings now hanging throughout Saint Mary and the Sisters of Charity of Leavenworth Mother House. Gerriann “Gerri” Knott Kozak, A’48, Lansing, Kan., died on March 9, 2015. Gerri is the mother of Chester “Chet” Kozak, C’78, Lawrence, Kan. Sister Mary Julianne O’Flannigan, C’49, Leavenworth, Kan., died April 12, 2015. She faithfully served as a Sister of Charity of Leavenworth for 59 years. Sister Mary Laura Huddleston, A’49, C’61, Kansas City, Kan., lost her brother-in-law, Fred Wennemar, on April 13, 2015. Ruth Ann “Ruthie” McAsey Krasovich, C’51, San Diego, Calif., died Aug. 18, 2014. Sister Anne Marie Burke, C’52, Leavenworth, Kan., died May 4, 2015. She faithfully served as a Sister of Charity of Leavenworth for 65 years. J. Carol Wegeng Ruegg, C’56, Norborne, Mo., died April 5, 2015. Margaret Malone Faciszewski, C’58, Aurora, Colo., lost her nephew, Edward Malone, on Nov. 30, 2014, and her oldest brother, Jerry Malone, on Feb. 22, 2015. Sister Mary Julitta Doerhoff, C’58, Leavenworth, Kan., lost her nephew, Kevin Stover, on April 8, 2015. Sister Mary Rachel Flynn, C’58, Kansas City, Kan., lost her niece, Kathleen, on May 5, 2015. Rose Inza Kim Surh, C’58, Seoul, Republic of South Korea, lost her husband, Charles. Rose shares this loss with her two daughters, Bernadette Surh Choi, C’84, Olathe, Kan., and Julianna Surh Lee, C’82, Seoul, Republic of South Korea. Sister Diane Hurley, C’59, Leavenworth, Kan., lost her brother-in-law, John, on March 18, 2015. Roberta “Robbie” Millert Franzmathes, C’61, Martin, Ga., died Dec. 28, 2014. Sister Virginia Bartolac, C’61, Kansas City, Kan., and Sister Mary Ann Bartolac, C’66, Kansas City, Kan., lost their sister, Therese Marie Bartolac Stubbs Thrailkill, on June 22, 2015. Rita Krueger Larkin, C’62, Presto, Pa., died April 18, 2015. Rita is the sister of Jackie Krueger Bassett, C’57, Alamo, Calif., and sister-in-law of Marilyn “Trudy” Trudelle Krueger, C’57, Emporia, Kan.
Mary Jo Maronick Tanzey, C’62, Coeur D’Alene, Idaho, and Barbara Maronick Sample, C’67, Billings, Mont., lost their sister, Jane Maronick DeWolf, on April 24, 2015. Jane was also the cousin of Sister Mary Vincentia Maronick, C’45, Leavenworth, Kan.
Barbara Wewers Beatty, C’63, Kansas City, Kan., lost her brother, Mike, on May 18, 2015. Mary Jane Johnson Boyd, C’67, lost her husband, L. Robert, on Dec. 2, 2014. Fran Petrovic Padow, C’67, Leawood, Kan., lost her father, Alex, on June 1, 2015. She shares this loss with her sister, Teresa Petrovic, C’73, Washington, D.C. Sister Clara Scherr, C’68, Billings, Mont., lost her sister, Anna Gray, on April 10, 2015. Sister Rita Orleans, C’68, Leavenworth, Kan., lost her sister-in-law, June, on April 2, 2015. Sister Mary Pat Johnson, C’68, Kansas City, Kan., lost her mother, Elizabeth, on May 2, 2015. Anne Nicks Crisp, C’69, Concord, Calif., and Ellen Nicks Rajdl-Villella, C’70, Wading River, N.Y., lost both of their parents. Their father, Bill Nicks, died October 27, 2014, and their mother, Barbara Nicks, died September 5, 2014. Penelope Lonergan, C’70, Leavenworth, Kan., lost her brother, Hugh, on March 1, 2015. Sister Maureen Hall, C’70, SCL community director, Leavenworth, Kan., lost her cousin, Terry, on May 19, 2015. Sister Dorothy Marie Rilinger, C’71, and Sister Jean Marian Rilinger, C’68, Leavenworth, Kan., lost their brother, Edgar, May 14, 2015. Sister Eileen Hurley, C’71, Leavenworth, Kan., lost her brother-in-law, John, on March 18, 2015. Helen Martin Swanson, C’73, Grove City, Pa., Kathleen Martin Cinfo, C’74, Nottingham, N.H., Barbara Martin William,* C’75, Judith Martin Kane, C’80, Kearney, Mo., and Elizabeth “Betty” Martin Sauvageau, lost their mother, Elizabeth “Betty” Martin, on July 7, 2015. Betty is the sister-in-law of Sister Mary Lenore Martin, C’47. Toni Telle Philips, C’73, Hot Springs, Ark., died Feb. 1, 2015. Regina Walsh, C’74, Olathe, Kan., died June 29, 2015. She is the daughter of Patricia O’Brien Walsh,* A’41, C’45, and niece of Betty O’Brien Markey, A’46, and Kathleen O’Brien Havey, A’48. Linda Jean Gervasoni Dunford, C’77, Venice, Fla., died Dec. 12, 2014. Laura Murray Beeves, C’81, and Pam Murray Grosdidier, C’83, lost their father, Don, on April 24, 2015. Margaret “Meg” Cronkleton, C’84, Gladstone, Mo., lost her uncle in April 2015. Lisa Ash Bowers, C’84, Cary, N.C., lost her father, Bill, on June 18, 2015. Julie Arauza DeGraffenreid, C’85, Phoenix, Ariz., lost her mother-in-law, Cecilia, on June 3, 2015. Sister Ann Schumacher, C’97, Kansas City, Kan., lost her uncle, Wayne, on April 26, 2015. Megan Trout, C’03, Austin, Texas, lost her sister, Nicole, on April 30, 2015. Dara Shea, U’09, San Diego, Calif., lost her brother, Keegan, on June 26, 2015. Note: The cutoff date for in memoriam was March 9, 2015. Information received after that date is not included, but will be included in the next print Aspire. 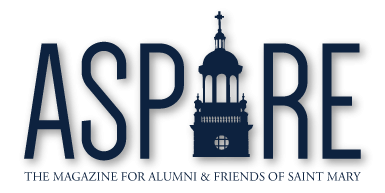 Email your class notes to alumni@stmary.edu.